The Amazing Race Family is saddened to report the first loss of one of its own. Margaretta of "Dave and Margaretta" Season 1, has passed away after a lengthy battle with cancer. 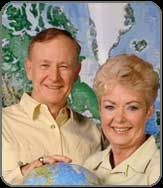 She and Dave, or "Team Grandparents", were racers on the very first Amazing Race. She quickly became beloved for her laughter and her charm, and became an integral part of the special camaraderie of the first race. When they were eliminated from the race, all of the remaining teams came out to show their respect and support for them both. That moment remains one of the most memorable in the history of the race, and was a tribute to the special bond that Dave and Margaretta had helped to create. She will especially be remembered for her joyous spirit and the courage she showed as she ran her own amazing race the last few years. She and Dave had been married for 48 years. Our hearts go out to David, and we send him all of our deepest sympathy. Margaretta was a truly lovely lady, and she will be greatly missed and remembered with love and laughter. I know she had not been doing well in the last year. If you remember in All Stars, Team Guido mentioned they were racing for her as she was sick during that time as well. It's so sad. Margaretta will be missed. Oh . Nooo not Margaretta. She will be sorely missed. I new it would happen. I had heard she was getting sicker from the cancer. But my prayers were with them and I hoped she would get better. RIP Margaretta! Here is Margaretta's obituary from a local paper. Groark, Margaretta, age 67, of Rockwall transitioned from this life on Oct. 26, 2008, after a tenacious three-year battle with cancer and pulmonary fibrosis. She was born to George Arthur and Mary Martin Bisson of Newport, R.I., on Jan. 12, 1941. On Dec. 27, 1960, she married her beloved fighter pilot, David, spending 48 adventurous and loving years together. Margaretta was an avid skier, SCUBA diver and pilot. She spent 10 years doing formation flying with David in air shows across the southwest. She and David participated in the first “Amazing Race” TV reality show. Margaretta adored children and was a CASA volunteer advocate for Child Protective Services and served on the board of directors for the Rainbow Room of Rockwall County. She was a reporter for two local newspapers and delighted her readers with a humor column in local newspapers, as well as several others. She also was published in both national and international aviation publications. Alexis and Christopher Gangeme; daughter, Lisa Wood, and husband, Steve, of Rockwall and grandsons, Zachary and Joshua Wood; son, Michael Groark, and wife, Constance, of Rowlett and grandchildren, Charlotte, Orion and Samantha Groark; and sisters, Michele Andrade of Newport and Mary Bisson of Portsmouth, R.I.
A memorial service will take place on Nov. 8 at 11:30 a.m. at the Unity Church of Dallas, 6525 Forest Lane, Dallas. Margaretta requested that no one wear black. In lieu of flowers, Margaretta requested that donations may be made to the United Church of Dallas in her memory. Margaretta’s desire is to be cremated and her ashes interred at the U.S. Air Force Academy awaiting her reunion with her fighter pilot husband. Margaretta was a Rhode Islander! And she still had ties to the Ocean State! I knew there was a reason why I liked her. Margaretta Bisson Groark lived a full and energetic life, whether she was running up the Eiffel Tower as a contestant on The Amazing Race , flying a classic AT-6 Texan trainer in an air show or volunteering as a court-appointed advocate of foster children. "She was an amazing person. Whatever she put her mind to, she could do," said her husband, David Groark of Rockwall. "She was a scuba diver, she was a skier. We never got over to climb Everest, but she would have loved to do that." Mrs. Groark, 67, died Oct. 26 at her Rockwall home of complications from cancer and pulmonary fibrosis. A memorial service is planned for 11:30 a.m. Saturday at Unity Church of Dallas. Her ashes will one day be buried with her husband's at the Air Force Academy in Colorado Springs, Colo. 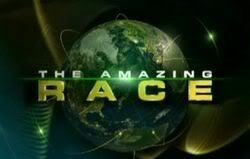 In 2001, Mr. Groark's then-59-year-old wife demonstrated her vigor as they competed with 10 other teams during the first Amazing Race reality show, he said. "She ran with a 40-pound backpack all the way up the Eiffel Tower to the observation deck," Mr. Groark said. "It was just amazing." Her other adventures included piloting a two-week blitz across Australia. Mrs. Groark was a licensed pilot in America and Australia, where she explored everything from the opal mines to the outback. "She flew for two weeks over three-quarters of the continent, to gold mines, to Coober Pedy. [She] probably saw more of Australia than most Australians ever see," Mr. Groark said. "I don't know how many Americans have an Australian pilot's license, but she was one of them." Mrs. Groark was born and raised in Newport, R.I. She studied foreign language at Duquesne University in Pittsburgh before being accepted into the foreign-service program at Georgetown University in Washington, D.C. Her studies, however, were interrupted in 1960, when she married Mr. Groark, then a fighter pilot. "She followed me all over the world," Mr. Groark said. In 1968, Mr. Groark was assigned to Eglin Air Force Base in Fort Walton Beach, Fla., where his wife entered the real estate business in 1971. During her 10 years in real estate, Mrs. Groark was an office manager, an operating broker and owner-manager of a firm. While in Florida, Mrs. Groark also operated National Telephone Search for Lehman Brothers, her husband said. "There weren't any computer matching systems," Mr. Groark said. "She had over 4,500 phone books down in the office and 35 girls working for her. They would research numbers for cold-calling for Lehman Brothers." In 1981, the couple moved to Rockwall. In Texas, Mrs. Groark was a sales agent for several firms at the Dallas Apparel Mart and a trade-show decorator for a 35,000-square-foot furniture showroom in the market district. In the 1990s, Mrs. Groark built a writing career that included eight years as a contributor and columnist for the Rockwall Chronicle. Her work, which appeared in a number of publications, was honored in 1995 with a Texas Gavel Award from the State Bar of Texas for writing about the juvenile justice system. Mrs. Groark also was a Court Appointed Special Advocate representing foster children in Rockwall County. She gathered information from caseworkers, family members and the children to present opinions to the court, her husband said. "Many times she worked in opposition with Child Protective Services, because she didn't agree with them," Mr. Groark said. She also was on the board of directors for the Rainbow Room of Rockwall County, which raises money for children in need. In addition to her husband, Mrs. Groark is survived by three daughters, Dr. Michele Curtis of Houston, Laura Gangeme of Rockwall and Lisa Wood of Rockwall; a son, Michael Groark of Rowlett; two sisters, Michele Andrade of Newport and Mary Bisson of Portsmouth, R.I.; and nine grandchildren. Memorial contributions may be made to Unity Church of Dallas, 6525 Forest Lane, Dallas, Texas 75230. Her ashes will one day be buried with her husband's at the Air Force Academy in Colorado Springs, Colo.
Margaretta Bisson Groark's passing. She was a very special lady, full of vigor and ambition...accomplishing many feats. She & hubby Dave were one of my favorite teams on TAR1 and I was really rooting for them. Well, her ashes will be buried not far from where I live, so maybe I'll put flowers there when that day arrives. I didn't know her, because I didn't see season 1, but that's too bad. She sounds like she was a wonderful person.